Home » How to Manifest » What Do You Do When Your Mind Insists on Focusing on Reality? What Do You Do When Your Mind Insists on Focusing on Reality? You're focused on creating your personal reality. You keep trying to live as if you already have your desire, but your mind insists on focusing on reality? You keep trying to think positively, but your mind brings you back to the problems around you? You keep trying to focus on what you want, but your mind points out what has happened in the past? What are you supposed to do? How do you stop focusing on reality? The problem is most of us only consciously use the Law of Attraction part-time. The rest of the time our subconscious takes over and uses it when we aren't really paying attention…when we don't fully realize that our subconscious is focused on creating a reality we don't want. You may want to resist the idea that you're sabotaging yourself subconsciously – especially if you don't like the reality you have created for yourself. However, until you are ready to acknowledge the role you have played in creating your life, you will probably continue to manifest a reality you don't want. If you allow your thoughts to pass randomly through your mind, the lack of direction can cause you to manifest the very things you don't want. Here's what happens: You spend the morning visualizing how you are in the perfect relationship with your soulmate. As you leave for work, you see a happy couple. You start thinking about how lonely you are and how you miss being in a relationship. You wonder what your ex is doing – does he remember you? Has he found someone else? What can you do to get him back? Should you contact him? Is there a holiday coming up that would give you an excuse to text him? You've gone from being confident, open, allowing and focused on the feelings of how wonderful it is to be in a relationship to a negative spiral of loneliness, neediness, fear, and control. You're using your power to create the very reality you're trying to avoid. Your mind becomes obsessed with focusing on reality. You're so fixated you don't even realize what you're doing. If you're like many people, you may not notice your obsession until someone points it out to you. You think you've been using the Law of Attraction to create what you want only to realize that you've been spending all of your time attracting what you don't want. 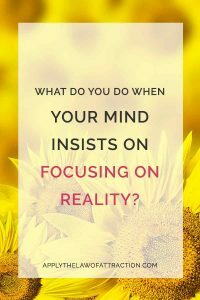 Even once you notice you've been focusing on reality, it can be hard to shift your thoughts. You have a habit of focusing on reality and you don't always know how to break it. You may need help eliminating your limiting beliefs and overcoming the resistance that lead to your focus on reality. The fastest way to create a negative reality is to focus on negativity. It doesn't matter if it's thoughts in your head or watching the news. What reality are you focusing on? If you want to know what you are focusing on, look at your conversations with friends and family. Read your emails and texts. Are your conversations, emails and texts positive or negative? Are you focusing on problems or opportunities? Are you complaining or inspiring? Are you finding fault or showing gratitude and appreciation? Are you looking for the worst in situations and people or are you finding the best? Most people think they are positive and actively creating the reality they want. But once they examine their conversations, emails and texts, they often find they were focusing on a negative reality, and they never realized it. How do you shift your mind to focus on a new reality? Look past the problems and negativity. See the reality you want to create. Focus on it. Pay attention to where you are going, not where you are now or where you have been. Focus on love, not loneliness. Focus on promotions, not disappointment at work. Focus on laughing with good friends, not arguments. Accept that you have created your reality and that you can change it by altering your focus. Allow opportunity to present itself as you focus on your new reality. Abundant mindset – Do YOU have one? After reading your great book and doing everything you say, I realized I have some hard time ‘living as if’ and ‘letting go’ at the same time. I don’t understand how I can let the person go and, simultaneously, live like I already have him back! Living as if is as simple as being the person you would be if you already had the relationship you want. I love this! I am reading your book and your site is very inspiring. Reality does sneak in when you are manifesting a relationship. Outer appearances in particular. Got to admit though when I see happy couples I am always happy and see that as a sign that what I want is manifesting. I was wondering, when living life as if what you want is your reality, do you have to think about your person all the time? I try to incorporate my person into my day whenever I have a chance. Such as imagining I am meeting him at the door after work, or cooking dinner with him. Stuff like that. Thanks, Mara! It’s great that you view happy couples so positively. That’s the perfect way to go about it. No, it’s not necessary to think about the person all the time. rather than creating them. Do I just imagine/ see in my mind the things I want? I don’t recommend using mind energy. Heart energy is faster and produces longer lasting results. I have read some of the heart energy articles but I am not fully understanding how to tap into it and use it. How do I tap into my heart energy? Read the category of articles on heart energy. You can find it in the right sidebar. It will show you all the articles on heart energy, including the ones on how to tap into your heart energy. I’m glad it helped you, Kerby! HI Elizabeth, I have read your wonderful e-book on Attracting a Specific Person. I am focusing (or trying to) attract back my ex fiance. I have also read articles here and there about letting go, and not constantly thinking about your ex. I even started flirting with another guy (as to not go crazy with missing my ex every excruciating second of every day !!!) whom I like a lot, but my love for my ex-fiance keeps pulling me back. That said, while my heart is still totally immersed in my ex, living this new flirtation is pulling me away from my goal which is for my ex and I to have another chance at being together. I feel that with this “letting go” I am pulling further and further away from my visualization and more into the reality of what is now… The thing is I have asked myself if my new reality is what I want, and it is not. I am still madly in love with my ex, but I am afraid that the fact that I have let go so much (mostly because thinking of him was hurting so much) that the “tie” between us has broken and he is getting further and further away without me getting him back. How does one realistically let go of a wish without letting it get so far?…. Very confused….And tired…. Thank you in advance for any advise you could help me with. I have been reading your articles and, I felt really very good and hopeful when I read that it is truly possible to attract a specific person the way I want. I want to add in here that I have been studying the law of attraction and practicing this for the past few months especially when my relation with my friend(or you can say boyfriend) started falling apart. I know I have not been good to him especially in the matters of trust not because he was into someone else but he just started giving me low priority because of his problems. After running into many quarrels, I realised that I have been doing wrong to him. The major problem to all this is, we are living in countries far from each others’. And, this created misunderstandings. Now, I am trying really hard to get all the things to get back as they were especially his deep love and care for me which I cannot see any more. I have been practicing the law of attraction and all through this process I have been continuously learning it more and more. Things are getting worse, as I don’t see them they way I want to see them. It looks like our relation is falling apart. If I try to talk to him about this, he just doesn’t like to or he just doesn’t answer my questions. Our daily talks on skype have come to an end. Our telephonic talk is getting less and less every day. I have become his least priority now he just doesn’t bother to inform me about his life happenings. I am really in pain. I do not know how to make myself imagine or feel when I see right in front of me that I am no more important to him. I have even started to fear to contact to him because he doesn’t talk to me the way I want. I have been practicing to keep myself positive and think what I WANT but i cannot see the things the way I want. They are getting more worse. Please, help me out. I have checked your book “Manisfesting Love”. After practicing so much of “positivity”. It feels like I am giving up on it. I want him to be in love with me again. You mentioned you have my book. I suggest you reread it and apply the techniques in it. If you read back over your comment, you will see how much negativity is in it, how negative your thoughts have been, and how low your vibrational energy is. This could be creating some of the problems you have had. Reread this article and focus on creating the relationship you want. Stop focusing on reality. Remember that you attract what you focus on. Read the following articles on fear and resistance. They may help you too. What is the best and the fastest way to reprogramming our subconscious mind? You might want to read the articles on this site covering resistance and limiting beliefs. I am loving your articles and books!!! I m almost done with the “Attracting a specific person” one and I am just reading up the part of attracting an ex back, which is my case. Without going into a million and one details, my ex broke up with me over 8 months ago now. We have had very very limited contact since then and usually not positive. I have had zero contact with him since January…He’s only written me once to ask me a trivial question about some common dealings we had in the past. I did not answer. I still love him and I want him back. I try not to worry (difficult to do) about him meeting someone else. But the thing is we are not in the same part of the world at all. He’s thousands of miles away, with no way of knowing about me, how I am doing (we had no friends in common), or anything like that… My question is that after almost a year, of not being together anymore, and actually zero contact, with different lives on different continents, do I still stand a chance to attract him back? I fail to see how the Universe can make that happen with not even the slightest bit of closeness and after all this time where so much could have happened in his life…. Is it possible though?